The Executive Director and staff carry out the mission of the President's Council to increase sports participation among youth of all backgrounds and abilities and to promote healthy and active lifestyles for all Americans. 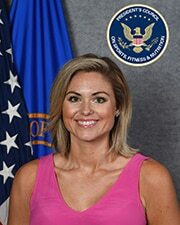 Holli M. Richmond was sworn in as the Executive Director of the President’s Council on Sports, Fitness and Nutrition on March 12, 2018. The President’s Council advises the President, through the Secretary, on the progress in developing a national strategy to expand participation in youth sports and to promote good nutrition for all Americans. Richmond is responsible for overseeing the administration of the programs and strategic plan of the organization. Before coming to the President’s Council, Richmond served as an Executive Recruiter for CyberCoders, out of Irvine, California. Richmond gained her public affairs and communications experience at the Defense Information School at Fort Meade, as a Public Affairs Officer in the United States Marine Corps. A native of North Carolina, Richmond graduated with a Bachelor of Science degree in chemistry from the University of North Carolina Wilmington. This led to a career in environmental chemistry, before her calling to join the United States Armed Forces. 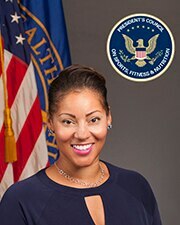 Shannon Feaster is the Deputy Executive Director of the President’s Council on Sports, Fitness & Nutrition. She previously served as Deputy Director of External Affairs at the Bureau of Health Workforce (BHW) in the Health Resources and Services Administration from 2014 to 2016. At BHW, she oversaw the development of communication and partnership strategies to strengthen the nation’s health workforce and connect skilled professionals to communities in need. Feaster originally joined the President’s Council as Director of Communications and Public Affairs in May, 2010. For employment opportunities with the Council, please visit www.usajobs.gov and use the Department & Agency filter to select ‘Department of Health and Human Services’. For more precise search results, use keyword search phrase ‘Office of the Assistant Secretary of Health’. For internship opportunities with the Council, please visit our Contact Us webpage.